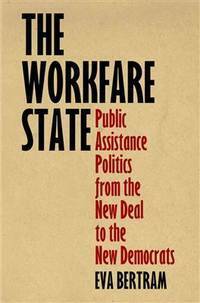 서명/저자 (The) workfare state : public assistance politics from the new deal to the new democrats / Eva Bertram. 발행사항 Philadelphia : University of Pennsylvania Press , 2015. 일반주기 Based on the author’s doctoral thesis from Yale University titled From welfare to workfare: the politics of reform. 일반주제명 Democratic Party (U.S.) --History --20th century. Welfare recipients --Employment --United States --History --20th century. Welfare recipients --United States --History --20th century. Public welfare --Political aspects --United States --History --20th century. Welfare state --United States --History --20th century. United States --Social policy --20th century. United States --Politics and government --20th century. The Workfare State challenges the conventional understanding of the development of modern public assistance policy. New Deal and Great Society Democrats expanded federal assistance from the 1930s to the 1960s, according to the standard account. After the 1980 election, the tide turned and Republicans ushered in a new conservative era in welfare politics. Bertram argues that the decisive political struggles took place in the 1960s and 1970s, when Southern Democrats in Congress sought to redefine the purposes of public assistance in ways that would preserve their region''s political, economic, and racial order. She tells the story of how the South—the region with the nation''s highest levels of poverty and inequality and least generous social welfare policies—won the fight to rewrite America''s antipoverty policy in the decades between the Great Society and the 1996 welfare reform. Their successes provided the foundation for leaders in both parties to build the contemporary workfare state—just as deindustrialization and global economic competition made low-wage jobs less effective at providing income security and mobility.